It’s not even 9 on Sunday morning, and already I’m out of my depth. Looking out of my new goggles and through a bubble-strewn maelstrom of churning waters, I can see the floor of the pool falling away far beneath me, and just for a moment, I consider drowning. The truth is, I’m into new territory here. Way out of my comfort zone. I’d thought it only in concentration camps that arrivals were routinely branded, until the ruthlessly efficient blonde by the desk had smilingly scrawled numbers onto my flesh. And a few minutes later, fearfully lined up in numerical order beside the pool, we’d all edged nervously forwards towards our fate. This was something different. We weren’t just starting a race – we were being processed. Every 15 seconds, the next poor soul was called, to commit their body to the waters. A few seconds clinging apprehensively to the side, and then on a count of five, four, three, two … GO ! they each launched themselves into the unknown. Back then, at the start, it had seemed bad enough. Exactly how I’d felt at my offshore survival training. That same sense of inexplicably rising panic, but without the survival suit. And now, seven lengths in, I’ve passed five minutes of chaos and confusion already – surprised and startled more than once by the uncharted appearance of a goggle-eyed monster, arms scything downwards and directly into my path. I’m not the straightest of swimmers, I’ve concluded. Not the fastest, either. I’d long ago realised that my wildly optimistic swim time forecast might do me no favours, and I’ve been overtaken half a dozen times already. Much more worryingly, though, I’ve forgotten how to breathe. Instead I’m choking down an unsatisfactorily swallowing, rushed kind of respiration, and a flood of fear through my mind. Am I swimming too fast ? That seems unlikely. With my only competitive swimming experience in the under-12 Leamington Spa Schools three-width medley, I knew that the pool was no place for adrenaline-fuelled heroics. I had to swim easily – when you’re stepping into the void, it’s good to keep some rope behind you. But still I can’t breathe. Finally I understand. This isn’t an open water triathlon (no crashing waves, freezing docks or new wet suit for me), but with forty thrashing bodies in the pool, the water is still choppy and it’s much harder to swim. That realisation calms me, just a little, as I contrive to survive for the last few lengths, and then crawl weak-armed up the steps, and limp into the chilly car park beyond. And outside, it’s amazing. A thousand bikes, all racked up neatly with their own towels, helmets, shoes, goggles, sunglasses and bananas – the whole triathlon shebang. I struggle for a moment to find my gear, and then I’m staggering into my running shoes and socks, struggling into my top and shorts, lashing down my helmet, and trotting towards the BIKE OUT sign and the open road beyond. And there I stay, for the next hour or so, pounding through the drizzle across the ancient Clopton Bridge over the River Avon, along the street where I grew up, down the country lanes to Charlecote and on towards Warwick. The same route I cycled to play squash in the school holidays, roughly 200 years ago. 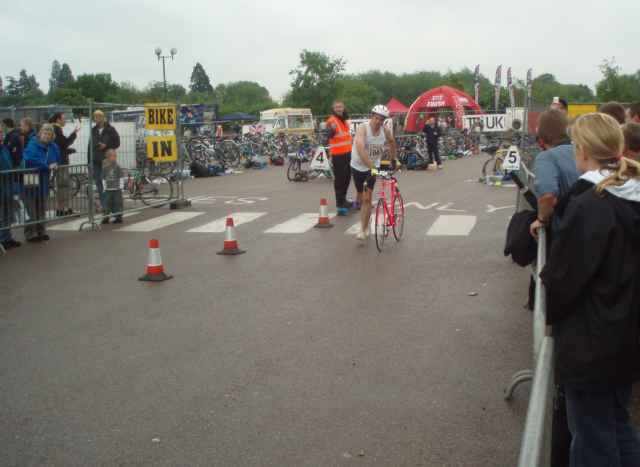 It’s new to me, this triathlon lark, and there’s a lot to learn. My next lesson is that heroes who swim 400 m in eight minutes are pretty mean cyclists, too. They’re a whole new species, these superhumans cruising past me with all the latest tri gear – evolutionary adaptations of smooth black lycra and pointy helmets. And their expensively exotic road bikes with solid carbon wheels contrast considerably with my 1975 Carlton Criterium, a venerable dinosaur with a dodo aboard. But we both know these lanes. I measure out my effort steadily – nothing special, just 28, 29 … 30 km/h, and keep going. A smooth new blacktop leaves the old road behind, skirting the village of Barford, with its smithy, glebe and Joseph Arch pub, named after the father of agricultural trade unions. A pint sounds quite tempting, but instead I forge on, over the Avon once more on a sleek brand new bridge. We cut left through tiny Sherborne, then turn onto the main road back to Stratford. 70 mph traffic thunders past, up a steepening drag towards Fulbrook. My mind wanders, and the geologist within me announces this as a scarp slope from Triassic onto Jurassic. I ponder this new information, and it’s not all that helpful. Five minutes go by, the toughest all day. Two more cyclists sail past near the top, then there’s a short flat and the relief of a 50 km/h descent of Black Hill. My tail is up now, and I keep it above 30 for the final few clicks home into town. Back at transition, I dismount as fast as I dare, slug a quick drink and set course for the run. This should be my easiest stage, but it feels nothing like it – since running with strained legs and numbed buttocks is a skill I haven’t yet learned. I slither over the floodplain and down to the river, past a fine stand of new trees which sprang up here mysteriously, a few years ago. The course loops around me, and from reading the runners’ numbers, at last I can understand the dynamics of this event. It’s clear that several dozen competitors have blown past me already, and with the sound of heavy breathing loud in my ear, there’ll certainly be more still to come. But there’s really no point in chasing these fast, superfit athletes who have been here so many times before. So instead I concentrate on the kilometres ahead, trying to visualise my efforts pouring out into the ground like the rain falling around me, aiming to expend my last drop of energy as I finish the race. One lap is complete now, and the second feels smoother and faster as I keep on draining my legs. But I can’t seem to kick any harder, until a few minutes from the line I spot a pair of struggling, old codgers. They look ripe from the taking – all spent, and about to be fossilised, here in the mud. Yet I pass them so slowly that my pace must be sub-glacial, too. The last turn to the finish, so I conjure a swift lope over the scrub and try to look much quicker than I am. There’s still something left, unpoured within my legs, I realise – some energy remaining that I just couldn’t transform into speed. My time today (1:32 ish) seems more trivial than ever. My performance ? As unpolished as my equipment, and probably much worse. But it doesn’t matter. Because my enjoyment and impressions of this fantastically organised event are enormous. 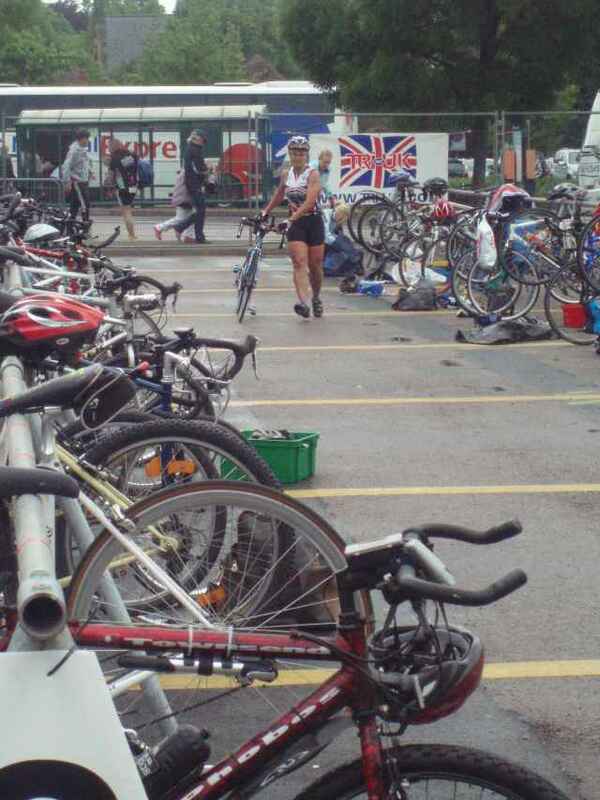 It’s a triathlon – my first. And I haven’t stopped grinning, all week. 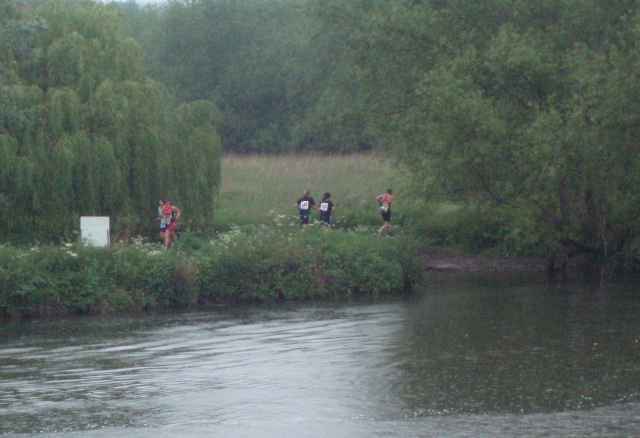 This entry was posted in 2007, racing, Shakespeare Country, summer, triathlon. Bookmark the permalink. I didn’t realise it was your first too, glad you’re still grinning, I am as well. What fun! I didn’t notice that we cycled over the Avon, or the nice yellow pub (probably a good job). I did experience 70mph traffic though. Must have had sweat in my eyes or something. Thanks very much, Angela. 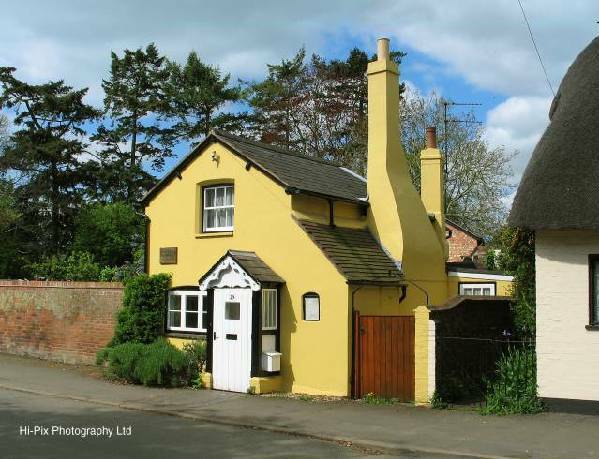 Joseph Arch’s yellow house lay just off the route in Barford, temptingly close to the pub of the same name. It’s no wonder you didn’t see the River Avon, though – your cycle leg was two minutes faster than mine. So did you go for the handlebar streamers and playing cards in the spokes like I suggested? Great job on your first tri. The course looks beautiful but it looks so cold, esp. if you’re soaking wet & riding a bike. Don’t worry, you’ll stop panicking during the swim by, oh, your 10th tri or so. 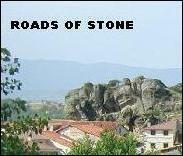 Congratulations Roads – an excellent effort. What were the distances involved? I’d like to try one of these Triathlon jobbies some time but, like you, take to the water like a housebrick. Not too hot on the cycling either, come to think of it . . . still, sounds like fun. Ah . . . just nipped across to Warrior Women’s site and found the stats. Good stuff Old Boy, I doff my cap. Yes, Elayne, to all of the above. 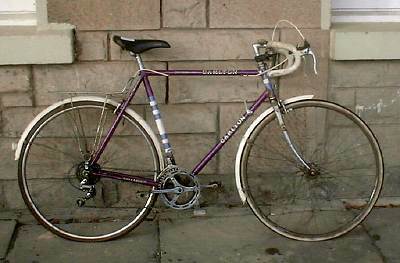 As well as a Brooks leather racing saddle, no less, and a rather sturdy padlock which I fixed to the bike in my student days, circa 1984, and then lost the key. I must get round to attacking that with a hacksaw. One of these days. Soon. 5 km run (going: soft to muddy) – 26:25. * well now, how do I actually get out of this swimming pool, exactly ? * and where did I put my bike ? * why can’t I get my socks on ? * maybe I can wrench my shoulder whilst pulling on that running vest ? * why is there a banana underneath my helmet now ? * why has this plonker stopped his car at the leisure centre exit, stock still in front of me ? * can I drink and peel a banana at the same time, without wobbling ? (No chance). * waving and smiling to the photographers, Steve Ovett style. Here’s to braving a new experience and living to tell the tale — congratulations! Many thanks as ever, BB. … but it was great fun, all the same. Congrats on your first tri! It sounded fabulous and I am jealous that you took the plunge. It’s good of you to drop by, Starrla. I hope you’re running as strong as ever, and enjoying your New England spring.